This was something I did not make this weekend but rather a couple of weeks ago. It is a great recipe for the kids. The meatballs are always a favorite among the little ones and it is a great way to get them to eat beans and other vegies that might be turned down in the normal case. The best thing to do is prepare the meatballs first. To to this mix together mince, egg and oats in a mixing bowl. Add salt and pepper to taste and the mustard. Make small meatballs and fry in a hot pan. Take out and pat dry. In the same pan add the onions, garlic, peppers and leek. Cook for and minute or so and then add the vegetable fond. Simmer covered for 10 minutes. Now, add the canned tomatoes and bring to a gentle bowl. Taste the stew and add salt and pepper. .If you have a purée mixer then purée the mixture. Otherwise, pour the mixture in a blender and purée. 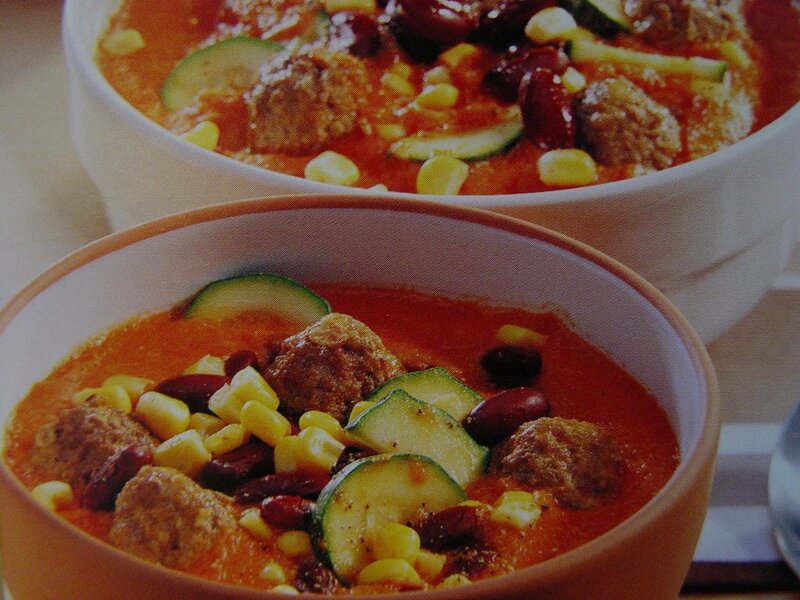 Now, add the zucchini, kidney beans and corn to the stew and simmer for a further 5-8 minutes. Add the meatballs and warm through. Before serving add a sprinkle of salt and pepper to taste. Serve this with nice, thick and good mixed grain bread. In Germany we are really spoilt for choice when it comes to bread, so it is not hard to find really good bread. The bakery I go to has a large selection of organic bread. For this I used a dark multi-grain bread and toasted this in a pan with olive oil. Soeri, loves this stew. As any three year old he loves meatballs with pasta, but when I served this I got a "ummmmm .... no need for pasta anymore mum!" Tom, who is not a stew fan, ate this with delight. For the both of us I had chopped up some red chillies that we sprinkled on top. This gave it a nice little spice.